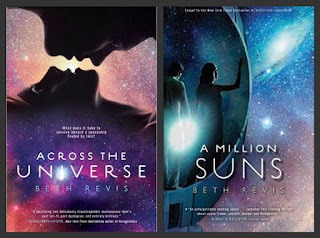 Yesterday on Wired, Geek Dad revealed the new covers for Beth Revis' Across the Universe trilogy. When I first saw a link to the article, I was very excited to see the cover of Shades of Earth, the last book in the series (release date January 15, 2013) . I clicked on the article, and was surprised to see the extreme difference Penguin went with the cover design. Personally, I don't hate the new designs, but I don't like them either. I prefer the old ones, as I believe they have infinitely more character, are simply gorgeous, and they excite me. The new covers are very predictable, and fall in line with the same old sci-fi genre books one sees on the shelves every day. According to Geek Dad, "Penguin has made the...decision to repackage the trilogy to broaden the target audience..." (Liu, 2012, para. 2). But who exactly is the target audience? Yesterday, after the news broke, I had a long discussion with three fellow book bloggers, Eileen from Singing and Reading in the Rain, Annabelle from Sparkles and Lightning, and Kayla from Kismet Kayla on Twitter. The opinion between the four of us was that this specific cover redesign, and other cover redesigns, did not work. Often the covers don't inspire an interest in the story, for collectors it ruins the series cohesion, and the redesigns can incur additional costs for those readers who like having the same format and style of book. 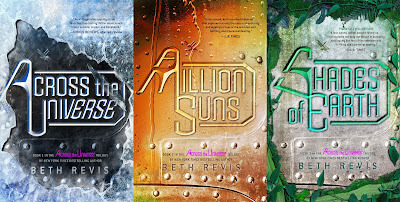 I can count myself in the audience that these covers do not target, and the only reason why I'm continuing with the trilogy is because I want to support Beth Revis. For me, the reason these covers don't work is the exact reasons I stated above; the main one being they don't excite me! However, if the point of this redesign is to target adults (which is only a guess on my part), or perhaps male readers, then I guess they've done their job. But it is interesting that we live in a society so influenced by the status quo of what is "right" for what audience, that amazing covers such as the first design are scrapped to make way for something a little less girly/juvenile. I wished there were more of an explanation given when redesigns of this magnitude happen. I'd like to understand from the publisher's perspective why they believe it is necessary, and what they hope to gain from it. Whatever the reason, I hope that the books continue to do well in all their formats, as Across the Universe is an amazing trilogy. I'd love to hear your thoughts on the redesign. Do you love it, do you hate, or do you not care either way? Leave your comments below, and whatever you're opinion, do check the books out because they are really worth it! Ugh. I personally hate the new covers, but I think they are meant to appeal more to male readers and to "hard sci-fi" readers. Interestingly, I think AtU was at the forefront of this explosion of YA sci-fi over the past few years, and now publishers probably feel safer now with a cover that's very clearly sci-fi than they did back when AtU was first published. Honestly, while there are a lot of gorgeous covers out there, it also surprises me how often publishers screw up, considering the money and time that goes into these things! I think that is the target audience, but I don't understand because while the first cover has an "almost kiss" scene, you can't really see it at first. I just think the old covers reflect teh beauty of space and I wish we could have Shades of Earth in it as well. They're not as bad as the US paperback for the Across the Universe. I really don't like that one. In other news, I should read that book. You really should read the books! They are amazing! And I'd have to agree, the 1st paperback cover let me underwhelmed. I'm thinking about making this into a longer discussion and going over some other redesigns, both of whole series, and from hardcover to paperback. I saw this yesterday as well. I agree and disagree with you. I like the new covers a lot. I like the metal of the ship and I like that each cover represents the theme in each book. Particularly the first book. The metal and ice are perfect. My decision to buy the first book when it released was not because of the first cover, but because of the amazing voice over in the book trailer. It stuck with me and I couldn't get her voice out of my head. So I think I would have bought Across The Universe even with this new cover. I will say that this is the only time that I have liked the redesigned cover. I'm not saying that I like it more, I just like it. In most cases, I hate the new covers. That being said, I would rather they had stuck to the original cover themes. As a collector it's disappointing to have all of the books from one series and yet none of them match. That is the case with nearly 80% of the books on my shelf now. Publishers are constantly changing themes now and it's most frustrating. The most obvious redesign mistake was with the Nightshade series. What were they thinking? The first covers were WOW and the redesigns were so boring. 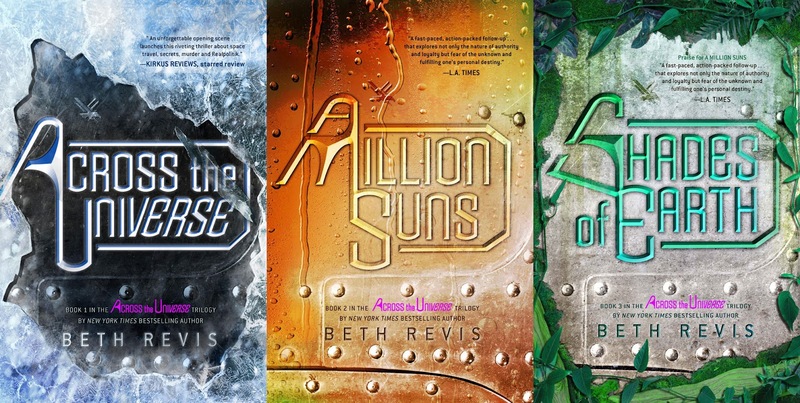 At least in the case of Beth's series, I like the new covers. Unfortunately, the third book will not match the two I already own and since mine are signed it's not like I can just replace them. I think that the new covers are well-designed in the fact that they do have a relation to the story. And I agree that covers aren't the make-or-break decision when it comes to buying/reading books (if they were we'd all be cover bloggers ;) ). I would just like to know, I think, more from the publishers as to why they make these decisions, because, as you mentioned, it happens a lot, especially in YA. I'd like to know why as well. In this case, It probably has to do with wanted to reach more male readers. Why didn't they think of that before? idk. However, most of the time there isn't a very clear guess as to why they make the changes and authors usually never remark on the cover changes. I think it hurts the book even. The cover for Unravel Me doesn't match it's prequel Shatter Me even a little. I'd been seeing Unravel Me around the internet, but never paid it any attention cuz I didn't care for the cover. Until recently I had no idea it was the sequel to a book that I actually enjoyed! I could have completely missed out on it. I like the old ones too. It is neat to see the new covers though.